This week’s post is a guest post from Zach Prez. You take stunning child portraits that can change the attitude and environment of an entire household simply by displaying your work on the wall. 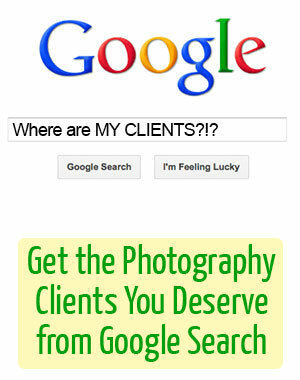 Why doesn’t Google see your website in the same light and reward your quality photography with an outstanding rank? First, search engines look at your website differently than clients. Search pays special attention to titles, URLs, and image text that clients ignore. Second, people search for more than a “photographer in city X.” Clients search a particular style, season, and price all in a single phrase. This post outlines how to rank well for dozens of key topics in your niche so you can finally get the business you deserve from search. As a photographer, you know better than anyone how the same subject can deliver a completely different message by changing the lens. Think of your website the same way. Posting a session and expecting Google to understand the detail and depth of the page is like trusting a client to see the beauty and perfection in a raw photo. To cast the best light on your website content, it helps to know where search engines weight keywords. When a potential client searches “photographer in city X,” Google’s job is to find a page about that topic. The closer the page matches the search topic, the better chance of ranking. Ranking tip #1: Use keywords in your title that will be searched by people who don’t know you. Hint: You can see all your titles quickly by typing site:http://www.yoursitehere.com into Google. Ranking tip #2: Choose very specific keywords in titles of your subpages, galleries, and blog posts. While the above may be good homepage SEO, most photographers stop there, resting an entire SEO strategy on one phrase and one page. That’s the equivalent of opening a bookstore and only selling the Harry Potter series. What about the 100,000 other niche “titles” that sell one-to-two copies a month and make the company a profit? That’s where photographers need to title each page something specific that might be searched. This means no more client names in your photo gallery or blog post titles. Sorry! I like how this approach to titles attracts an audience much broader than the one family who hired you. A specific title works well in Google, Facebook, and email newsletters to attract people who are interested in apple orchard photos (pretty unique). These topic-focused pages get more clicks across the web and have less competition, making it easier to be found by prospective clients. Otherwise you will be competing with your homepage to rank for the same phrase. 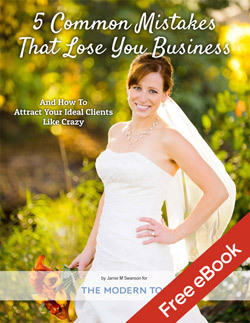 Ranking tip #3: Describe your photo sessions in detail on the page. Although clients don’t need or want text on the page, Google uses it to understand what’s happening on a deeper level. The well written post above goes beyond the title and uses text on the page to describe the session. 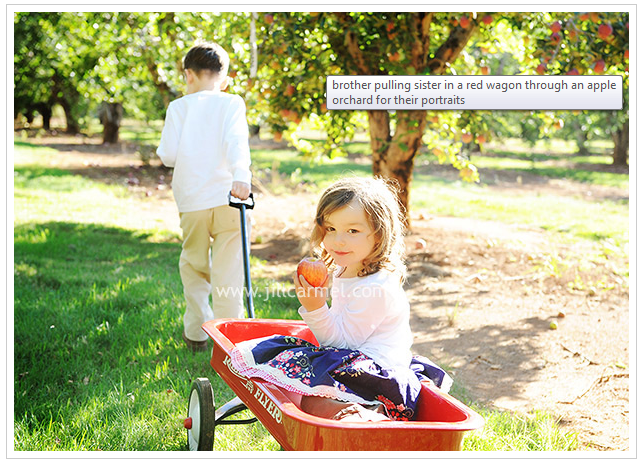 Words like brother, sister, beautiful, pictures, red, and session are all very searchable variations of the main phrase. Google wants about 300 words of text to feel confident that there is enough substance for the user to want to see it. Ranking tip #4: Describe your images naturally with alternate text so Google can see them. Now, if everything else on the page was blurred out, I would still know the topic of the page based on the first image alone. So does Google. Multiply that by dozens of images across hundreds of posts – Google can understand exactly the types of sessions your shooting, all from simple alt text invisible to clients. Ranking tip #5: Focus on ranking your best/most important pages, and sell yourself clearly on those pages so searchers hire you. Optimize Your Best Pages, Not Your Most Recent Pages! If I could guarantee one page from your site would rank well tomorrow, which page would it be? Probably not your latest session that doesn’t showcase your best work. You’d probably create a new post, showing your best photos, and a clear offer so that the searchers are sure to contact you. That’s what a post like “Sacramento spring mini sessions” will do for you. It targets a very specific phrase that not a lot of other photographers compete for. It shows a variety of work and includes reasons to hire and a clear link to book a session at the bottom of the page. Imagine how your business will take off when every post you write ranks for something unique AND gets the searcher to call and book you every time! Want to learn about how to get more traffic to your website? Get Zach’s free eBook called 5 Traffic Sparks for the Online Photographer! Zach Prez is the author of Photography Spark and brings 10 years of internet marketing experience to his blog and ebooks for photographers. When his fingers get tired of web work, he’s probably having a cup of tea, coaching soccer or riding his bike along the Sacramento river.